Editor’s note: Melissa Hillebrenner is the director of the United Nations Foundation’s Girl Up campaign. The views expressed are her own. 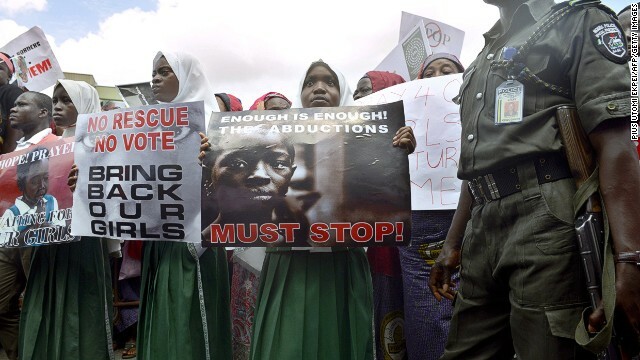 Thursday marks 100 days since more than 200 schoolgirls were abducted from their families and community in northeast Nigeria, a reminder of the horrors and hardships many girls face when trying to get an education. It’s difficult for many of us to imagine what it would be like to be taken from a place that is supposed to be safe. Sadly, this situation is not unique to Nigeria. In too many communities around the world, girls are criticized for going to school or denied their right to education completely. Worldwide, more than 60 million girls of primary and secondary school age are not in school. I just returned from a trip to Guatemala, where I met Teresa Vivia, an engaging 16 year-old who lives in the town of Santa Maria Chiquimula. Vivia’s parents both passed away, and she lives with her sister-in-law. She wants to go to school, but had to stop going so she could take care of her nephews and the house. Lack of access to education is just one barrier facing girls like Teresa Vivia. According to data that UNICEF released earlier this week, "more than 700 million women alive today were married as children. More than 1 in 3 – or some 250 million – were married before 15." Many have to drop out of school to manage household chores, are vulnerable to abuse and are often deprived of the information, tools and services to plan their families. This has tragic consequences: Girls who have children as children face higher risks of complications from pregnancy and childbirth. In fact, these complications are a leading cause of death for adolescent girls in low- and middle-income countries. The challenges facing girls are enormous, but there are hopeful signs that the realities are changing. I’ve met girls from around the world – from a small village in Guatemala to a refugee camp in Ethiopia to a big city in the United States – who are speaking out for their rights and for their sisters. They’re biking miles and miles to get to school, writing letters to their leaders to change laws, and putting their safety at risk to escape child marriage. Such courage has a powerful ripple effect. Research shows that educated and empowered girls lift up their families, their communities, and their nations – helping to break the cycle of poverty and improve the health of societies. These girls are standing up for change; now is our time to stand with them. How? For a start it is essential that we make sure education is the right of all girls, not a privilege for a few. This means creating economic opportunities and getting rid of discriminatory laws. It means condemning child marriage and enforcing laws against it. And it means making sure girls have access to quality health care and addressing their sexual and reproductive health rights and needs – including family planning. It also means making sure girls are counted. Millions of girls are never registered at birth, which can make them invisible members of society. Not having a birth certificate often prevents a girl from going to school, seeing a doctor, or getting a job when she's older. The U.S. Congress has introduced bipartisan legislation, the Girls Count Act, which would support programs in developing countries to improve birth registration and promote policies that prevent discrimination against girls. Let’s get this bill passed. And we need to go even further: we need to collect more and better data to give us a more accurate picture of the lives of girls and the struggles that they face. Right now, we just have a partial snapshot, because we don’t have a lot of data in many countries and on a global level that is broken down by age and gender on issues including health, education, and economic participation. But programs like Data2X, launched by then-Secretary of State Hillary Clinton in 2012, are leading a gender data revolution so we can assess the status of girls and women and make informed decisions on how best to address their needs. Ultimately, though, if we’re going to make a real and lasting impact for girls, we need to change hearts and minds. For too long and in too many places, girls have been unseen and ignored. Instead of devaluing girls, let’s empower them. It’s their right and our opportunity to build a better world. It you want real change girls. Get rid of your bigotry and ignorance. Women's lack of rights and education is often based on local culture & poverty, not religion. No it's not. The local culture and poverty is caused by Islam. Therefore, Islam IS the problem. This has been a problem before Islam or Christianity came along. Even if it wasn't, how do you explain the same situation in non Islamic regions of India or places such as Latin America which are largely Catholic? This sounds like a job for " SUPER PALIN " ! She can talk in circles until the Islamic men are dizzy and fall down. And their eardrums will start to bleed. Then they will beg to be "put out of their misery". Well at least she's got that going for her. The whirling cure for Islamic folly us one of the better suggestions of the day, @ So True, but please stop being disrespectful to Sarah Palin. I'll stop being disrespectful when Sarah Palin STARTS becoming respectful. Not going to happen now is it. I'd take these UN-related reports more seriously if they didn't include phrases like "creating economic opportunity." The USA offers many areas that would benefit from better economic opportunity, right in our own backyard, as folks say. We also say, "charity begins at home." Lololol @ Joey, but she DOES talk in circles! So youre sayin Sarah Palin works at the UN? Lol lucky them! No, I don't think that the UN has hired Sarah Palin. However, I do know one woman who is involved with the UN-related charitable efforts, and Sarah Palin's couture does not approach the UN lady's for immediate impact of obviously excessive expense, especially hats and oh-wow fabric. Lol @ Joey! That was kinda my point! Plus @ Joey i pretty much agree with the posts about SP! She has to earn respect and i havent noticed that shes even trying!!! Fantastic beat ! I would like to apprentice whilst you amend your web site, how can i subscribe for a blog site? The account helped me a acceptable deal. I have been tiny bit familiar of this your broadcast provided bright clear concept.